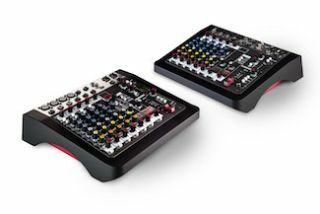 The What: Allen and Heath has released two more ZEDi models, the ZEDi-10 and ZEDi-10FX, from its ZED analogue console range. TheWhatElse: Designed for recording/gigging artists and AV rental and installation companies, the new ZEDi models combine a compact mixer with a 24-bit, 96 kHz, 4x4 USB interface, which enables multitrack recording and playback to a Mac or PC or to an iOS device (using a Camera Connection Kit). The ZEDi-10 and ZEDi-10FX feature four mono channels with separate XLR and TRS jack sockets, one stereo channel and a second stereo input for reverb returns or playback. The mono channels include DI high impedance circuitry for the jack sockets, allowing guitars to be plugged straight into the mixer without the hassle and expense of carrying separate DI boxes. ZEDi-10 and ZEDi-10FX from Allen and HeathAdditionally, the ZEDi-10FX includes an in-house designed FX system which encompasses multi-FX models, combining reverbs, delays, doublers, chorusing, and other modulators to create a dynamic and varied suite of studio quality sound effects. The new ZED models also feature three-band EQ, 60 millimeter smooth travel master mix faders, FX/aux/monitor and headphone outputs, channel monitoring and 48V phantom power. Unique in this type of product is the individual channel PCB construction with nutted pots and a robust internal, universal voltage power supply. The Bottom Line: The ZEDi-10 and ZEDi-10FX are flexible tools for any mobile artist looking for an all-in-one recording solution.